Hi! Excursion in Tangier. 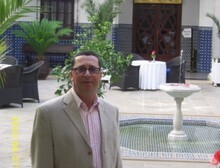 I am Sarhan and I provide private tours in Tangier and other cities of Morocco. Let me tell you about one of my tours. This 8-days expedition to Sahara and Ouarzazate may become your only chance to witness the divine beauty of arabic world. On the first day we will arrive to Casablanca or Marrakech. From there we would fly straight to Ouarzazate. After a little rest in teh hotel our great journey begins. We will visit such place as Ksar of Ait-Ben-Haddou in Ait Benhaddou where many films were shot. The second day would be all about traveling in Skoura and Boutaghrar. We would drive to the Amagoun Mountains. The fascinating landscapes of Berber villages make one speechless. On the third day of our tour we would visit the Kasbah du Pacha el Glaoui in Taliouine. Tour with private guide in Tangier. Then the village of Ikniouan awats us. Our final destination of the day would be the city of Zagora. On the fourth day we ould see such landscapes as Berber villages, desert plateaus, desert Dunes. Arriving to Merzouga is our goal of the day. The day five is devoted to camel excursion in the blacks Village. Then we’ll drive to Erfoud. Not every private guide in Morocco can afford it The sixth day of the tour will be about visiting the town of Rissani, which is the oldest town of the empire. The seventh day we spend in Todgha Gorge in Tinghir. We will see the rose valley, the Kasbahs; then the skoura palm grove, a very misteryous and beatiful place. After Todra Gorges we head back to Ouarzazate. And finally the last eighth day of our journey we spend in Ouarzazate and then depart back home.